When someone is the victim of crime, they are likely to receive the help they need from trained professionals who have earned degrees in the field of criminal justice. Those interested in attending criminal justice school in Nebraska may go on to pursue careers helping victims understand their rights and navigate their way through the justice system at the local, county or state level. From law enforcement officers to detectives, lawyers, judges, and the many legal support professionals involved in the industry, criminal justice school grads in Nebraska can look forward to taking advantage of higher than average job growth projections over the next several years. Learn more information on the criminal justice schools in Nebraska, the types of jobs that are available in-state after graduation and the different degree levels required to work in the criminal justice industry. After Criminal Justice School in Nebraska: What's Next? Finding the right criminal justice school in Nebraska isn’t an easy task, but using the list below can help. The top criminal justice programs in the state are scored and ranked here, based on factors that matter most to students. No matter what the career goal, this list shows the best criminal justice schools in Nebraska with statistics on the cost of tuition, the types of criminal justice degrees available at each school, acceptance rates and more. Western Nebraska Community College was established in 1926 to serve more than 12 Nebraska counties and today offers post-secondary education programs from its campuses in Alliance, Sidney and Scottsbluff -- or at 27 training centers in the panhandle. Students can complete one of WNCC's 117 degrees, diplomas, and certificates. The criminal justice department offers a selection of educational options including two-year associate of arts or associate of applied sciences degrees or an undergraduate criminal justice certificate. Students can complete supervised internships at criminal justice/law enforcement organizations in the region. All CJ programs are offered at the Alliance, Sidney, and Scottsbluff campuses. Founded in 1974 to serve Douglas, Dodge, Sarpy, and Washington counties, Metropolitan Community College is among Nebraska's fastest-growing postsecondary education institutions. Within the criminal justice fields, MCC's associate of applied science degree programs are offered with a corrections pathway, or a law enforcement focus. Both the 99-credit law enforcement or 99-credit corrections concentrations are offered at the Elkhorn Valley Campus, Fort Omaha, Sarpy Center, South Omaha, and online. Students must complete an internship to qualify for graduation. Applicants that have completed a P.O.S.T. accredited academy can petition for class credit. The three campuses in Columbus, Grand Island, and Hastings that make up Central Community College serve a 25-county area in central Nebraska. CCC's 36 technical education and career programs lead to associate degrees, diplomas and certificates -- all requiring two years or less for completion. Students can also complete a two-year program comprising the general education requirements for transferring into a four-year degree program. All three campuses offer the full criminal justice curriculum, leading to an associate of applied science degree, a police field services diploma, or undergraduate certificates in corrections, police science or private security. Northeast Community College was founded in 1973 to offer students liberal arts degrees, college transfer programs, technical/vocational training, and continuing education courses. The main campus is located in Norfolk, with extended campuses in the Nebraska communities of O'Neill, South Sioux City, and West Point. The interdisciplinary associate of arts degree with a concentration in criminal justice program can be used as training to enter the criminal justice field or transferred as credits into a four-year criminal justice degree program. NCC operates a Mobile Crime Lab and offers students practical observation opportunities with the Madison County Jail and Omaha Correctional Facility. Southeast Community College provides full degree and certificate programs at its campuses in Beatrice, Milford and Lincoln. Its 11,000 students can pursue over 50 programs of study that can be completed in two years or less. Twelve academic programs can be completed completely online. The two-year associate of applied sciences degree is offered with options in major fields of criminal justice, Nebraska law enforcement, corrections, homeland security, or juvenile justice. Completion of the program also qualifies students for advanced placement into four-year criminal justice programs at Nebraska institutions. Students must complete a supervised internship to qualify for graduation. Nebraska Wesleyan University's criminal justice degree is delivered in a flexible format for working professionals or adult students. Classes are five or eight weeks long and meet one night per week. Courses focus on the sociological factors of crime while giving students a solid basis of knowledge on the criminal justice system. Participants will also learn about crime investigation, gang culture, white collar crime, and cybercrime. The criminal justice degree is one of the school's adult programs, giving students access to academic services for adult and graduate students. These include collaboration with a coordinator who can assist in developing project topics, revising a paper, and forming successful study skills. Criminology courses at the University of Nebraska at Omaha examine the causes of crime, as well as society's response. Programs can be completed at both the metropolitan Omaha campus and the standard Lincoln campus, and students have opportunities for hands-on learning to bring their classroom education into the real world. Many students participate in the school's juvenile mentoring program, which pairs them with youth from a local rehabilitation and treatment center. As mentors, students help the youth transition back into the community once they leave a facility, assisting them with schooling, applying for jobs, and developing healthy relationships. At Bellevue University, students in the criminal justice program study law enforcement, corrections, and the courts. Learners examine legal and ethical principles and analyze criminal behavior, unpacking contemporary social issues and the policies that surround them. The program is offered both online and in a traditional setting. The school has a flexible transfer policy for students with credits from prior study, and there is a military veterans service center to assist active duty military and veterans in earning their degrees. Students can polish their resumes, cover letters, and interview skills through the school's career services center, which offers online and in-person tips and tools for job hunting success. Wayne State College's criminal justice major offers a bachelor of arts or bachelor of science degree program for students who seek careers as police or corrections officers, child protection agents, youth support workers, or fraud investigators, among other relevant careers. The program includes an internship during junior or senior year, as well as a Spanish or other foreign language requirement. Student services offered by the school include academic advising and tutoring, a writing help desk, a counseling center, and disability services. Most students in the program continue on to entry-level jobs after graduation, while a small percentage chooses to pursue a graduate degree. Students in Midland University's criminal justice program learn about the nature, beginnings, and impact of criminal behavior in the United States. These subject-specific topics are taught in conjunction with a solid liberal arts foundation for a holistic approach to education. Students learn problem-solving and communication skills to serve them as they enter the workforce in probation and parole, corrections, law enforcement, or juvenile diversion. Beyond academics, students participate in a wide variety of activities and organizations to connect with like-minded peers. They include the criminal justice club, the student senate, intramural sports, and fraternities and sororities. 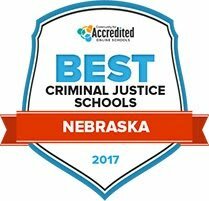 Want to see all the options for criminal justice school in Nebraska? The search tool below includes all accredited institutions that offer criminal justice programs in the state. Prospective students can compare and sort programs based on factors such as location, type of school, degree levels, acceptance rates and student population. Whether fighting crime on the street or fighting for justice in the courtroom, legal and protective service professionals can use the education and skills learned at criminal justice school in Nebraska to land one of these popular careers. The table below highlights some of the most common professions in the field in Nebraska, with state-specific information on how many workers are employed in each field, the type of degree each requires and salary information. Students who earn criminal justice degrees in Nebraska want to be confident that they will get a valuable education that prepares them for a professional career in the state. The following tables include information on the salaries that criminal justice professionals earn in Nebraska specifically, as well as projected job growth in the state compared to the national average. Just as with any profession, criminal justice school graduates can expect to find the most jobs in Nebraska’s larger cities. The map below gives a breakdown of how many jobs are available in different areas around the state. In addition, the table includes salary data and an overview of some potential employers in each location. An organization made up of in-house corporate attorneys in Missouri, Kansas and Nebraska. The group offers training and networking events, an online job board and more. This organization provides support and education designed to help build businesses, with a base in the state’s laws and business regulations. A business leadership group that promotes and advocates for businesses and economics across the state, the Nebraska Chamber also offers a scholarship program for those attending college in the state. The Nebraska Department of Economic Development provides information about the regulations that business owners must follow to operate in the state. This page links business owners with resources including legal services such as trade names, document filing, compliance forms and certifications. This office provides networking opportunities for Nebraska entrepreneurs as well as informative resources including business counseling, events and legal information. For those interested in learning more about Nebraska’s correctional facilities and reports, the Council of State Governments provides details about Nebraska’s justice system on this page. This website includes information on correctional facilities around Nebraska and the services that the agency offers. Students can find information about topics such as parole, training and professional development and other initiatives. An organization that advocates for juvenile justice education and reform. From initiatives like Police-Youth Engagement efforts to a scholarship program for college students pursuing juvenile justice degrees, this site has many details on what this niche field encompasses. This page can help students better understand Nebraska’s parole process by providing information on parole guidelines, practices and management. This site allows students to access information about the court for attorneys, jurors, and the general public so they can better understand court and judicial regulations. The Juvenile Justice Institute (JJI) works with lawmakers to create policies that best serve the juvenile justice system. Learn more about their projects, reports and other resources here. Court reporters around the state can take advantage of continuing education courses and professional networking events through this organization. This website also lists information such as legislation, rules and membership opportunities. Since 1991, the Office of Dispute Resolution has provided mediation and dispute resolution services around the state. The agency works in concert with nonprofit mediation centers in Nebraska to provide accurate information on legal topics such as court, welfare and probation disputes. Legal Aid of Nebraska provides pro bono legal services to low-income and at-risk Nebraska residents. Services are provided by attorneys, paralegals and other legal staff, and the organization provides internship opportunities for students to gain experience. Users can search for state laws and regulations through this website’s search tool. Paralegals in Nebraska can get news, attend industry events and search job postings through this organization. There are also resources for students including paralegal scholarships, student memberships and frequently asked questions about the profession. The state bar association provides continuing education, publications and events to legal professionals and students in Nebraska. A professional organization that promotes advancement of women in law and the legal industry. Open to both men and women, the organization is open to men and women, students and legal professionals. NALPI promotes professional standards for private investigators in the state. Students can learn more about the profession, find helpful documents and get meeting information here. This agency oversees the training and education of law enforcement officers around the Nebraska. This website also provides information about crime commissions, legal updates and certifications. A membership group that provides services for police officers in the Nebraska, including continuing education opportunities, state statute information and details on legislative processes related to policing. This agency regulates hunting in Nebraska, manages fisheries, and works to conserve public lands. Students can learn more about conservation regulations and continuing education opportunities here. An initiative from the Nebraska Game and Parks Commission, the Wildlife Crimestoppers is a cooperative wildlife law enforcement program. Students can also find details about becoming a game warden. This page connects students and conservation workers with information regarding education and conservation services around the state. This group works to rehabilitate wildlife and preserve natural habitats in Nebraska. Learn more about education, volunteer opportunities and conservation in the news here.